We just made our first journal of the season available and I am sorry I didn’t have a chance to update the “Update” at the end. We’d had that piece poised and ready to go out for almost a week but hadn't been unable to connect our laptop to the internet via a hotel phone or an internet shop. When we arrived on Santorini from Naxos we thought we had a hotel with a suitable phone for transmitting—“Wrong!” So we dropped our bags and started hoofing around town in hopes of finding a willing and able internet shop before things closed up for the day. After one refusal, some waiting, and a bit of folderol Bill scored and was able to send and receive our emails at last, albeit a slow connection, so our update was sent out without making it more current. The good and the bad news is that our lousy weather in the Greek Islands has given me a chance to once again prove a friend right in calling me “Word Woman,” as I’ve been getting my files caught up. That means I’ve had 4 files stacked up. This one and the next (#2 & #3) are both “Nerd News” editions and are about the more technical issues of our travel rather than the sights and sounds. The 4th one is just about finished, which catches you up to date on our travels. Since our ability to connect is tenuous I am going to do what I try to never do and that’s flood you with our backlog of updates--who knows when we will connect again. But all of these troubles let you know that the subject of this Nerd News, the challenges of connecting to the internet, is still very real for us. our laptop, cables, connectors, line filter & line testers. Finally, Nerd News is Back! This Nerd News began almost a year ago as a telling of the tale of our misadventures in connecting our then new laptop to the internet. It grew large and unwieldy and Bill thought it too tedious, even for technical information. It has taken the boredom of being marooned by high winds on the Greek island of Naxos for me to find the concentration needed to rewrite the whole thing in earnest. It may not be of interest to many people, but hopefully will be of service to a few travelers or their friends in easing their struggles in using overseas phone systems or connecting to the internet. If the 40-60 mph winds don’t subside soon, the second half of Nerd News, which is primarily about bike equipment issues, will follow shortly. Beware abroad when you attempt such a simple task as picking up the phone to make a call, especially a long distance call, that the challenges can seem to be endless (unless of course you are willing to entrust your wallet to the hotel for long distance charges.) We call Portland once a week to update our outgoing message on our voice mail with information such as where we are and where we are headed, so we have lots of experience with out-of-the-way phones. Most of us are unaware that when we dial “1” in the US (and Canada) to make a long distance call that we are actually dialing our country code. Every country has a code and it isn’t too hard to imagine how we ended up with #1. I have seen the codes range from 1 to 3 digits long, plus “00” that precedes them all. So, when we are out of the US and want to call our home number, we dial “001” before the area code. Overseas, you usually only use the country code when dialing between countries, unlike in the US. You have to look for them but it isn’t too hard to find country codes. Most tourist guide books will have a list, some hotels or phone booths will have them posted, and they often appear in the phone books. But if you know you will be calling another country, it’s good to locate the country code before you need it as they can be rascally to find in a hurry. Zeros are the bane of international dialing. Often you need a leading zero to dial a domestic call when in Europe but if you dial that same number as an international call, you’ll drop the leading zero when you add the country code. We flail about and try our calls with various “zero” strategies ‘til the call goes through. And in countries that are changing their phone systems, what you do with the ‘0’ may vary from one town to the next. Many countries have a number that looks like an area code to us embedded in the number, as is slowly becoming the standard in the US. Ask a local person if the number you are dialing looks reasonable if you are having trouble placing a call. Even if they don’t speak English they may quickly spot your dialing error by looking at your selection of numbers. Oh, and “800” numbers: check your emergency numbers before leaving home for “800” numbers as they are useless overseas. Yup, can’t use them. That 800 number for a lost credit card, traveler’s checks, and insurance company--they are all worthless. It can be like pulling teeth to get a toll number from some US companies unfamiliar with the problem but get them if you can before you leave home. If you will only be making calls to the US in an emergency, then it probably isn’t worth trying to get around these high rates. But we spend about 10 minutes each week listening to messages and updating our out going message on our voice mail, so it quickly becomes a noticeable expense for us. Using your mobile phone from home will stick you with pricey per-minute rates. European mobile phones aren’t much of an option for travelers as the companies require a stable, local address to purchase a phone and calling plan and the rates are high once you leave the country in which it was purchased. We have talked to people who maintain their old phone when they move to a new country to get around this problem. The price of satellite phones is coming down but we still consider them prohibitively expensive. Phone cards and not coins are definitely the way to go when using pay phones, but even they aren’t always straightforward. We have incredible phone card angst these days from all the problems we have had and the money we have wasted on phone cards. A phone card is usually only good for the country in which it is purchased and be sure to mention the country you intend to call when purchasing it. Some “holiday” cards are designed only for calling home while abroad, like for German tourists calling home from Turkey. And if you are on an extended trip, be aware of the expiration date in fine print. Some cards are good for only 1 month after your first call, others are good for years. We always quickly assess if private phone cards are available, as they are in most countries. Poland is definitely an exception in that you can only use the government issued phone card. When available, the private phone cards can offer huge savings, getting the cost of a call to the US down from 50 cents to a dollar a minute to sometimes as low as 3 cents. Big cities are the best place to look for bargain phone cards. Sometimes a shop in a major train station will sell them. Another good place to buy cheap phone cards is in the part of a big city that caters to African residents (also often near the train station). African entrepreneurs set-up private phone booths in tiny shops for fellow ex-pats to call home at good rates (and without owning their own phone). In addition to renting time on their phones, they often sell discounted phone cards. Occasionally internet shops will also sell phone cards. Wherever you buy, make sure they know you aren’t buying more time for a mobile phone but a card for a pay phone. I usually flash my old card when I am buying to make up for missing vocabulary words. If discounted phone cards aren’t an option or can’t be found, you can usually buy the government’s phone cards at the post office or at a tobacconist’s street side kiosk. Phone cards are prepaid in fixed amounts, so you have to guess how much credit you need to make your call or calls. If you don’t use up all the credit on the card then you are just out the remaining value. Finding a private label phone card isn’t always easy and collecting on the good rates can be confounding as well. They don’t usually have time of day rate fluctuations, but they are full of challenges. Our most recent card in Germany had a special number to be used from phone booths, so instead of getting the 3 cent rate, we were paying 50 cents a minute when we didn’t know to use the special number described only in German. About half the time we used that card we were unable to complete our call. And we got a “disconnected number” message when we called tried to call the phone card’s customer service number. In addition to the potential choice between government and private phone cards, you will likely get to choose between the computer chip or insertable cards and manually dialed PIN cards. The PIN cards have the advantage of being usable at almost all phones, including your hotel room phone and are often cheaper to use per minute. And sometimes we get a much better rate from the same PIN card when calling from the hotel phone and not a pay phone on the street. The chip cards tell you how much time you have left on your card in displayed numbers, which gets around the language barrier of announced messages about your account balance when you are dialing. In some countries we have found it best to have both types of cards on hand and use what ever works in a given situation as not all phones are able to accept a chip card. And in Poland where all the phones are owned by the government, there are at least 2 different types of non-PIN cards. One was a computer chip card and the other lacked a chip but was inserted into the pay phone like a chip card. We were very frustrated as only 1 compatible phone type was available in a given region and the line between pay phone regions was invisible to us. We had a fist-full of 3 different styles of unused and partially used phone cards when we left Poland in our attempt to have what we needed to place our Sunday night calls home. Not all pay phones will permit you to make international calls so look around on the booth (if there is one) for mention of international calling ability. I haven’t noticed this in all countries but it is worth being on the look-out for such restrictions. Perhaps one of the most threatening changes to us in phone calling is the phasing out of pay phones that permit international calls. That may only be happening in Germany (or maybe it is only because we can read the little digital messages provided in English). After I dial, a message will often travel across the tiny display giving the date on which the last international calls can be made from that phone. The ubiquitous mobile phones have already decreased the number of pay phones available, but restricting international calls to a few pay phones will only make calling harder for us. In Greece and Poland, some phones will not respond to keypad usage after the call connects, so you cannot use any mail-box type systems, such as our Qwest voice mail. We can dial our number just fine and leave a message if we were of a mind to, but we can’t listen to messages left for us as that requires using the keypad. And there is no way to tell by looking at the phone: you pay your money and take your chances. We spent $10 one day unsuccessfully trying to find a Polish phone that would let us into our voice mail box. Poland has upgraded its phone system and Greece is in the process--we are now concerned that it is the new and not the old phones that are the problem. Just this month (3/03) we have subscribed to the communication system sponsored by the guide book company Lonely Planet. It has a number of handy services but the only service we are using is their international calling system. They claim to have low rates, but in the 2 countries we have price-shopped—Italy and Greece—the government phone cards are actually cheaper than Lonely Planet’s rates. We gave them our money knowing this but hoping that that their system will allow us to call the US when we can’t get through with our regular cards. We are also hoping that their system might let us access our voice mail box in countries like Greece and Poland where we have had difficulty in the past. We’ll let you know as we gain more experience with their product. Here is their website if you want to check out their products for travelers: www.ekno.lonelyplanet.com. Our 2 basic approaches to connecting our laptop to the internet are either plugging into an ordinary phone line in a hotel room or connecting through an internet shop’s computer equipment to their LAN. Both can work and both approaches have a seemingly endless maze of challenges to be discovered and overcome. It has been horrific to see how difficult this process has been and that I personally couldn’t have made a single transmission work myself. Bill has done 100% of the connecting and it has taxed his knowledge of computers endlessly. His experience goes well beyond that of the average user as he has written programs for business applications and for years was the de facto MIS director for a small company. Even with his background, he has just barely been able to get us connected, and intermittently at that. Line testers are important in these days of higher voltage digital lines—inadvertently hooking-up to one can fry your modem. The standard phone lines that we all know are analog and analog is what you want but you can’t tell by looking at them or listening to them. “Buy before you fly” is our passionate advice with line testers as they are hard to find in Europe (and hard to even describe when shopping). When we gave up on connecting at internet shops last summer and went back to using hotel phones, we pounded the pavement in large cities of several countries looking for a line tester to replace the one that we had sent home. And the clerk in the airport shop in which we finally bought one was sure that they didn’t have such a thing. So do yourself a favor and bring one from home. In Austria, we were told that line testers were not necessary as the digital and analog lines had incompatible plugs. We don’t know if it is true in Austria though we were told so several times, but we know it isn’t true in many other countries—you can’t count on differentiating digital lines from analog by looking at the phone line plugs or the phones. -One evening in Poland Bill finally discovered that the more automated phone line tester was actually blocking the phone line. This new tester has a line protector function built in, so it is to be left in line when making the calls. (Our other tester is usually not left in line.) The call finally went through when he removed the new line tester from his hook-up. -In Germany one time when plugging in the automated tester, it initially showed the line was a dangerous digital, and then it reconsidered and flagged it as a safe analog line. Weird, as phone lines are either one or the other with no chameleon possibilities. -Then there was the line that apparently had such a weak signal that neither our automated phone line tester nor computer modem could detect a dial tone: as far as both were concerned, there was no phone line, digital or analog although you could place calls using the handset. Sometimes finding a phone line can be demoralizing. After weeks of not being able to connect via a suitable phone or an internet shop in Austria, we decided to forego all sightseeing and pound the pavement in Salzburg until we succeeded in connecting. We were at a campground with a single internet connection, but the owner said his system was so jury-rigged that he didn’t want us messing with it. We inquired at the business centers at the high-end Sheraton and Crowne Plaza hotels with no luck. We even snuck into the free email stations set-up at a medical conference in the convention center, only to find incompatible equipment. One computer shop where we bought parts let us use his line but it was an incompatible, high speed line. We also tracked down every internet shop in the city, and still had no success. We exhausted our creative problem-solving ability and courage-reservoirs and left the city still unable to connect to the internet. Had we stayed at one of the expensive hotels in town we might have been able to connect but we weren’t yet willing to gamble the $150+ as they might have had digital lines or some other unsolvable problem (and you just don’t know ‘til you try to connect). In Berlin, we scoured the terminals of 2 of their 3 airports hoping to find a single pay phone with a data port to no avail. And more than once we have asked to see rooms in a number of hotels in a town so as to inspect the telephone equipment and still found nothing usable. probably won’t get in through this phone system. Sometimes the phone systems are incorrectly wired in hotels (the pair of wires carrying the phone message are reversed). Your phone tester may detect this glitch. Some testers will automatically correct this problem, while others will just tell you about it. Reportedly, the only significance is that the transmission will be slower with reversed polarity, but you should still be able to connect. Our 2003 kit of connection supplies has been expanded this year by the addition of a line filter. Line filters will filter out the pulsing sound that some phone systems toss in as a way of monitoring line use. We don’t know if such pulses are interfering with our transmissions but Bill is going to experiment with this device at times when he can almost but not quite connect. We’ll let you know in a later Nerd News if it helps. In Brno, Czech Republic, we had a touch-tone looking phone that was actually a rotary, pulse dial phone in disguise. Bill patiently spent about an hour resetting the spec’s on the computer to be compatible with the rotary phone and used up his bag of tricks, with no success in hooking up. Finally, he tried connecting as though it was a touch-tone phone and easily made the connection. When desperate, try the opposite of what is recommended. Like when the hotel clerk and guide book both say to use a leading “0” before the city code, try it without the “0”. Bill has had that be the missing step in more than 1 transmission. Hotel phone systems are sometimes hay-wired (as opposed to hard-wired). More than once we have not been charged for calls because they don’t show up on the front desk system and once they attributed calls to us that were not ours. The biggest problem we have knowingly had with goofy wiring was in Croatia were the front desk phone also rang into our room. When Bill was sending out a batch of emails with photos, the transmission kept getting interrupted. He wouldn’t lose the connection, but everything would pause for a half minute. By the next morning we had had enough experience with the front desk calls to our room to assume those pauses were incoming calls messing up our transmission (thank goodness it was low season!). A couple of hotels only had one phone line for the entire hotel so if the staff or another guest was making a call we would get an unusual tone instead of a dial tone on our handset. For domestic long distance calls in Poland, our guide book says you must also select the 4 digit number of 1 of 4 providers, though Bill hasn’t found that to be true. “Buy before you fly” applies to connecting through internet shops too, but this time it is an Ethernet card you need. 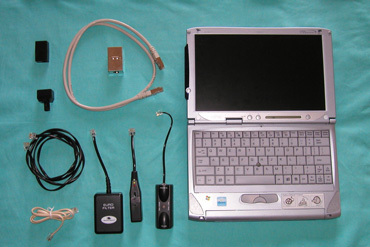 Our petite Fujitsu laptop has both a 1394 Net Adapter and an Ethernet port built in. Only the Ethernet port has been useful to us as that is what is compatible with most internet shops. Bill was sure our Fujitsu had an Ethernet port but when he went to use it in Turkey he couldn’t find it. After much hair-tearing, he called Fujitsu in the US (also not easy to do) to ask about the spec’s of the Ethernet card he should buy and was told he already had one. But the little darling had an automatic shut-off so there was no sign of it when he went looking for it on the computer. With Fujitsu’s help, he was able to track it down and switch it on. So, know what you’ve got before you leave town and make sure you can find it (both the hardware and the software interface) on your system. -Often the shopkeeper will need to assist in manually entering TCP/IP settings on our network software to get around their firewall instead of using the more standard “Auto” settings. But it is rare that the person staffing the shop at the moment will have a clue about the needed settings. (One shop in Croatia charged a hefty fee for this service). -The social problems are best solved by looking for a small shop with at least 2 or 3 computers and with a curious owner/manager on duty. -In some shop’s the system units are inaccessible, so there is nowhere to plug-in. -Occasionally the cables on the shop’s system are very short. Bill often ends up sitting on the floor, sort of folded and tucked under the table top, while he up-and-down-loads our emails. One Turkish shop owner was quick to offer a pillow for him to sit on. In shops with a little longer cables, he sits kind of sideways, with the laptop precariously balanced on the corner of the table. Bill was finally able to buy an extension cable (the top white one in the photo) so he could sit with dignity like all the kids in the internet shop. Only once (in Gdansk, Poland) did we ask at an internet shop or tourist info: “Do you know where there is a shop where we can plug our laptop in?” and got a “Yes” answer. Generally, no one cares or has a clue. Perhaps it is because Europeans seem to be far less informed about their competitors than in the States where that information base becomes a part of customer service. We wrongly thought tourist info offices and hotel front desks would have started tracking laptop plug-in information for their business customers. We were especially surprised when we treated ourselves to a business class hotel in Zittau, Germany, (after escaping the floods) complete with spiffy, in-use conference rooms that the staff was still clueless as to where we could connect. They had an incompatible, digital phone line system serving the rooms and thought surely they would have a way to accommodate laptop using guests. We were also surprised that in Brno, Czech Republic that is an international trade fair center that none of the shops had any capacity (or willingness) to accommodate laptops. In contrast, we just about fell over upon discovering a small no-smoking café in Bolzano, Italy with 2 computers and an additional line just for laptops. -In Poland, the pleasant surprise was the high availability of phones in inexpensive hotels, unique in our travels. The bonus was that they were almost all standard, analog phone lines with modular plugs, so Bill’s life as internet man was made much easier. -In Turkey, room phones were rare, modular or otherwise. But the proprietors of the internet shops were gracious and willing to let him hook our laptop into their systems via Ethernet. (One Turkish shop owner even let us use his Ethernet card in our laptop before Bill was able to access our card.) In contrast, more up-scale Western European country shop owners practically threw us out for asking if we could connect. Please let us know if you or your friends have any sage bits of advice that would help in making long distance calls or connecting our laptop to the internet. These continue to be aggravating challenges for us. Just yesterday Bill spent about 2 hours at an internet shop in Naxos, Greece that had a separate line for laptops and even with the enthusiastic help of the owner he wasn’t able to connect.